Blue and white, I've got a crush on you! Always have, always will. This popular color combination is one of my favorites. I love its familiar yet surprisingly fresh vibe. 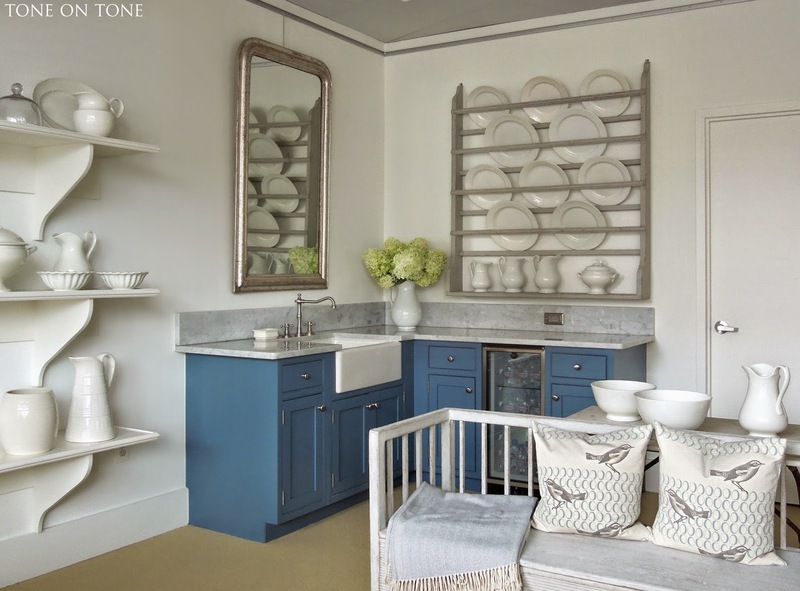 On Swedish gray surfaces, blue and white looks effortless and lovely. 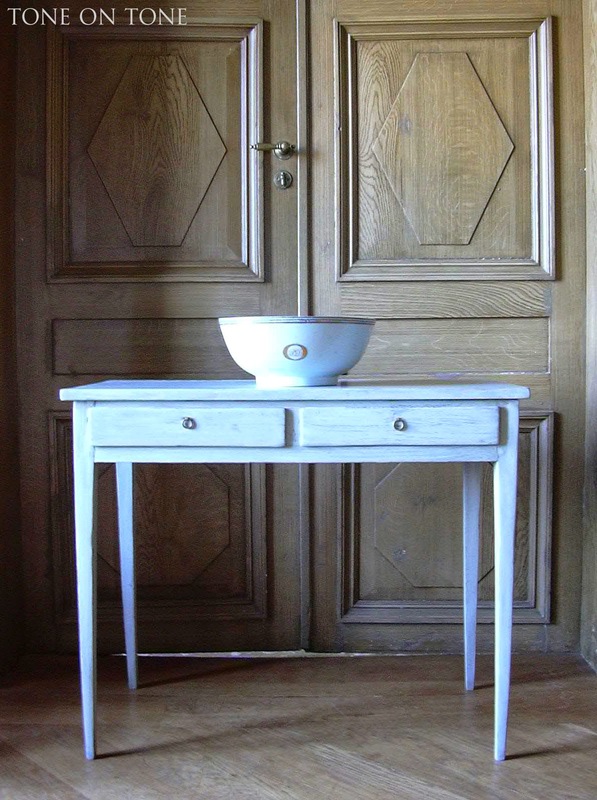 It's cool, calming and crisp against the Gustavian palette. 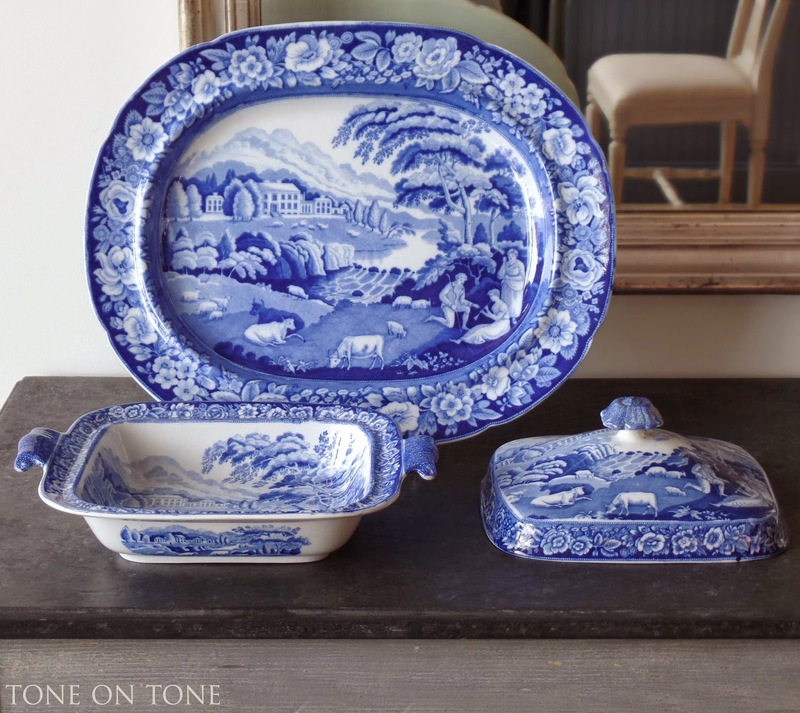 On period brown furniture, I can always count on blue-and-white accents to jazz up these classics. 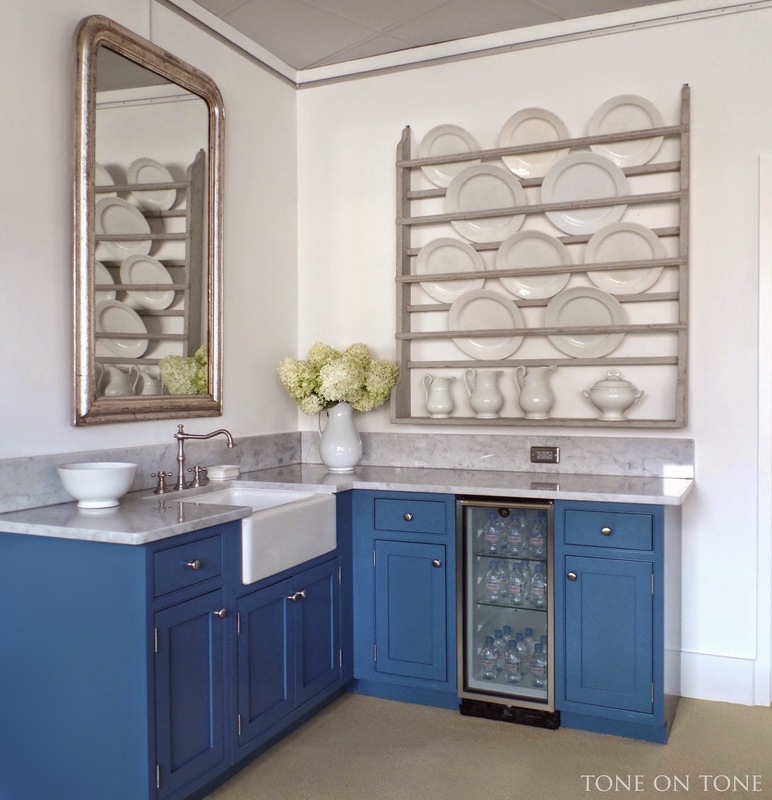 Whether used unabashedly or sprinkled here and there, this color scheme is timeless, versatile and beautiful. 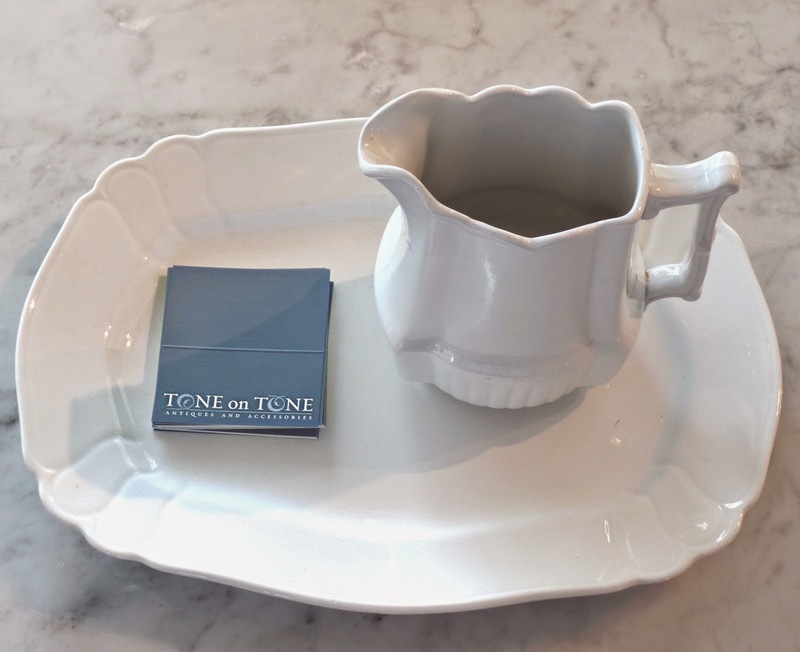 Check out how I incorporate blue and white at our shop. To cozy up our store, which has three sides of expansive glass walls, I had a small, homey kitchen installed. I designed it to be simple, functional and blue! 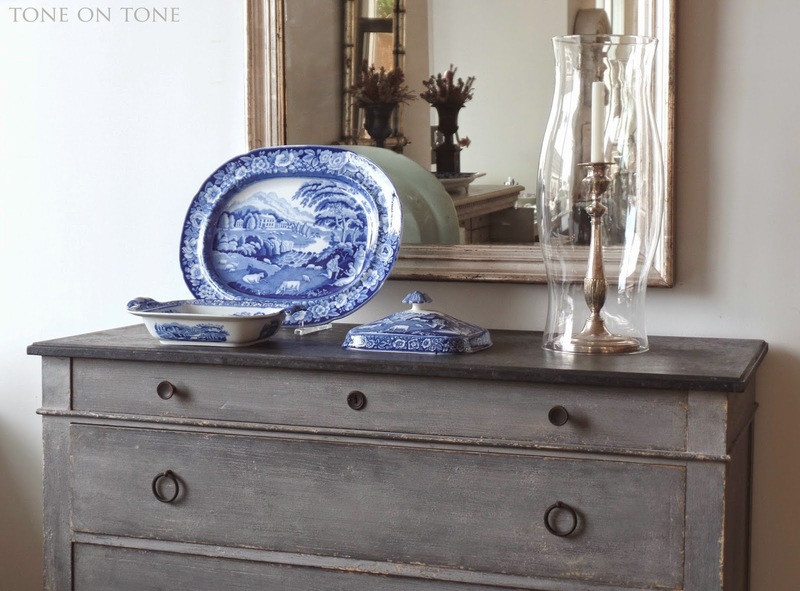 Simple to complement our inventory of country and formal antiques. 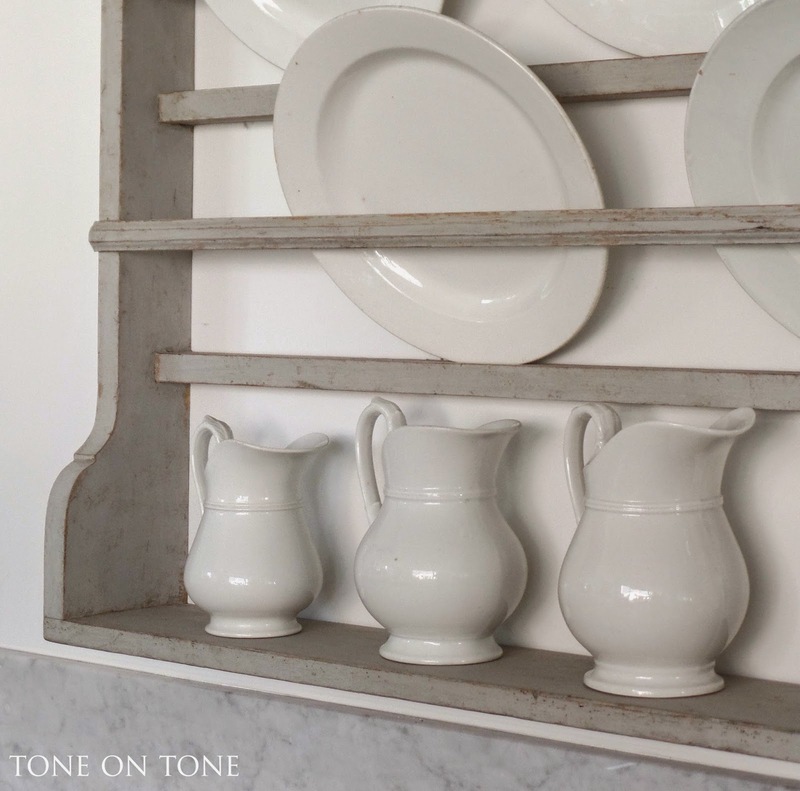 Functional for a variety of daily tasks: arranging flowers, washing china, etc. 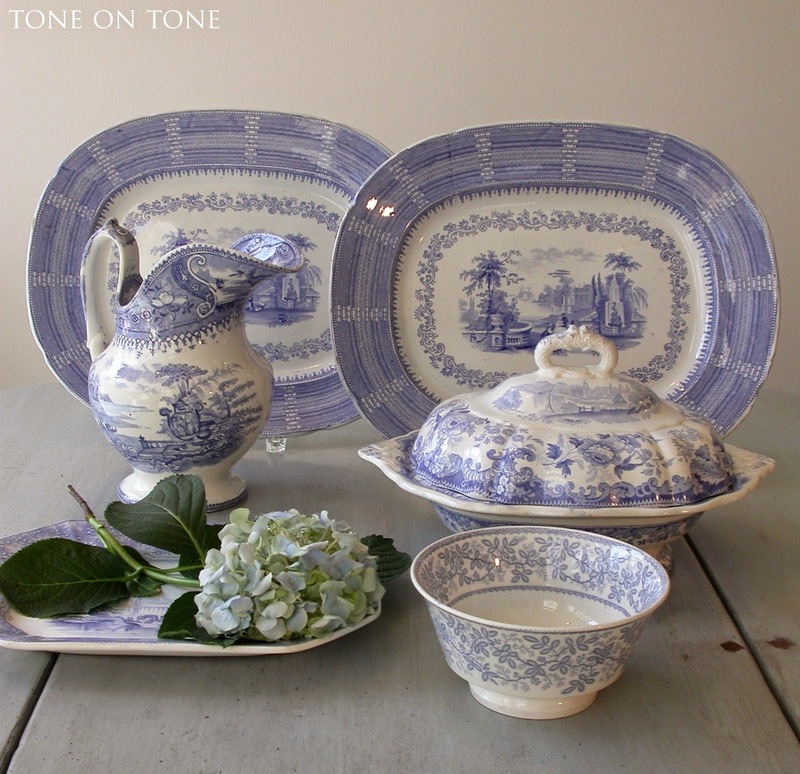 And blue because it looks terrific with pretty much everything, especially our collection of white ironstone. 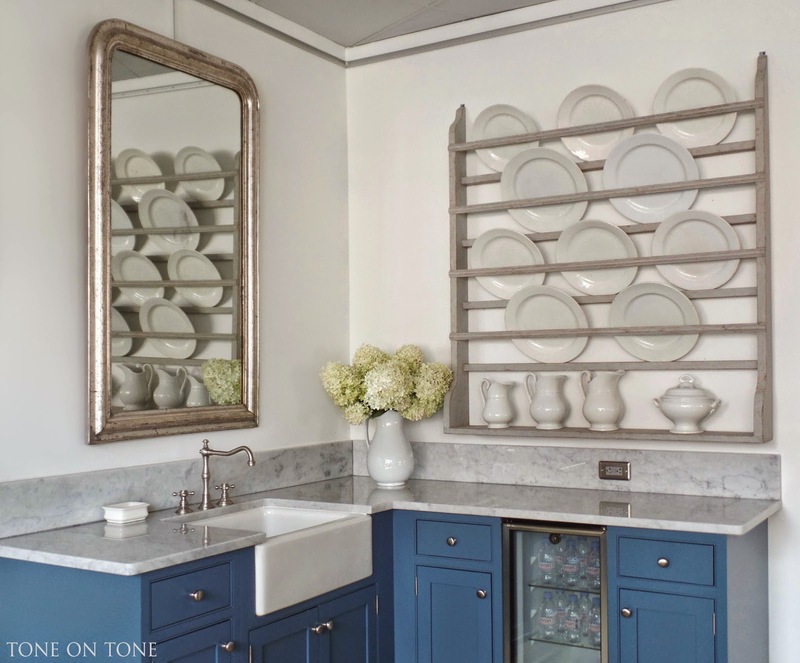 Currently over the kitchen area is a French Louis Philippe mirror in silver gilt and a large Swedish plate rack with a collection of antique ironstone round platters. 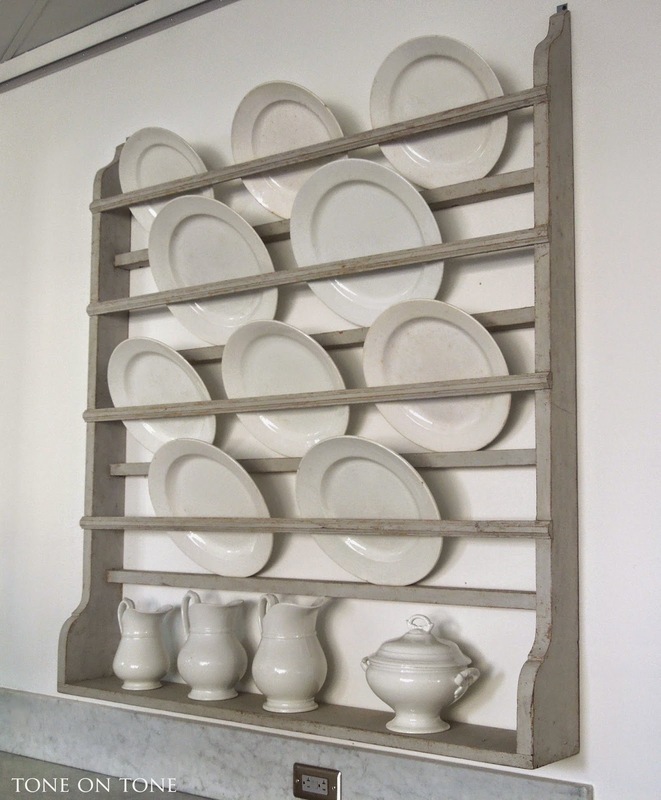 The four-tier rack with lower shelf holds both platters and plates. Along with white, our business cards have similar shades of blue - Pantone #646 and #644. 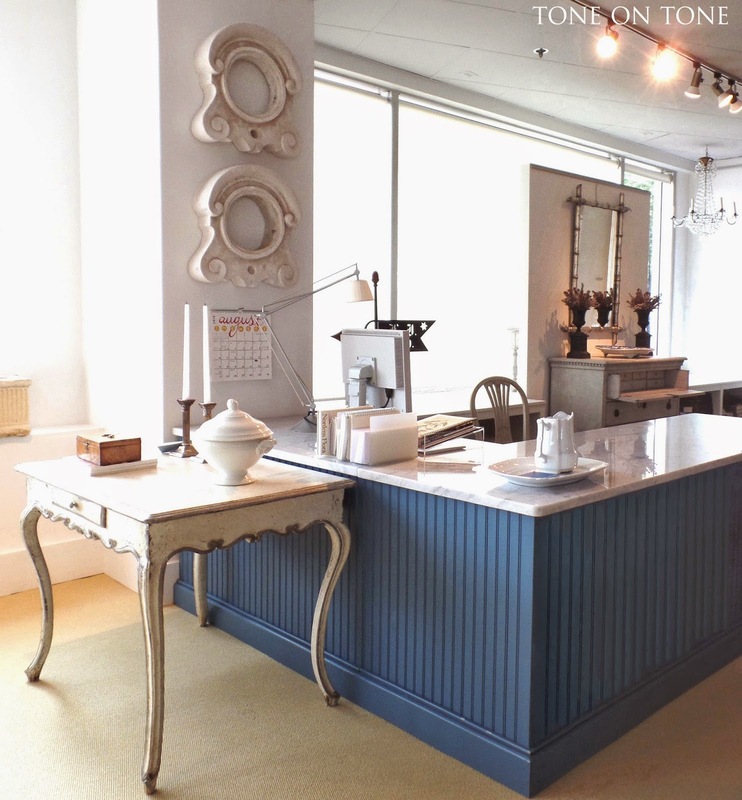 And the marble-top beadboard sales desk is also blue. No post about blue and white would be complete without a look at china. 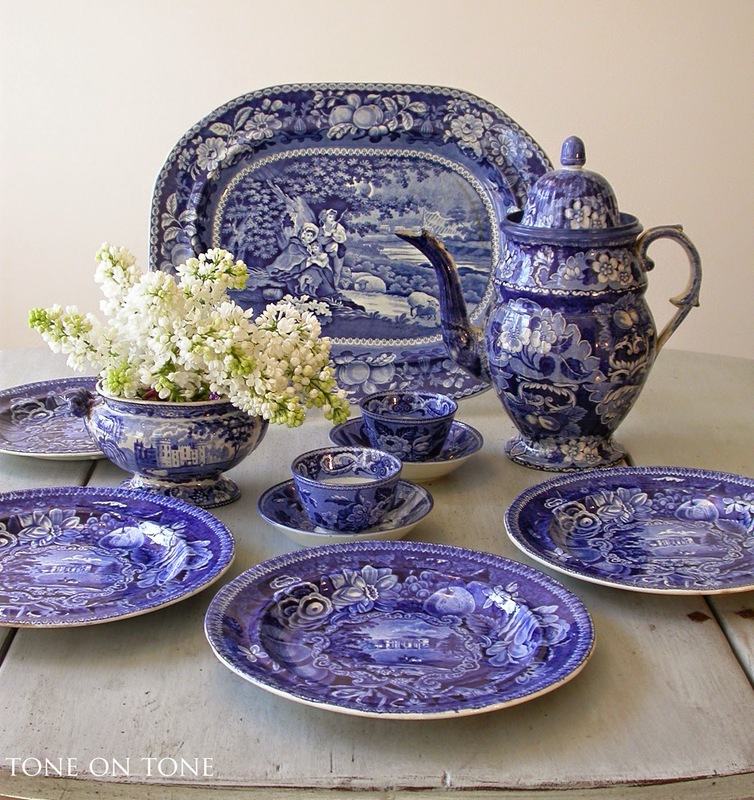 This color scheme has been used for centuries on Chinese porcelain, Dutch delftware, English ceramics, etc. 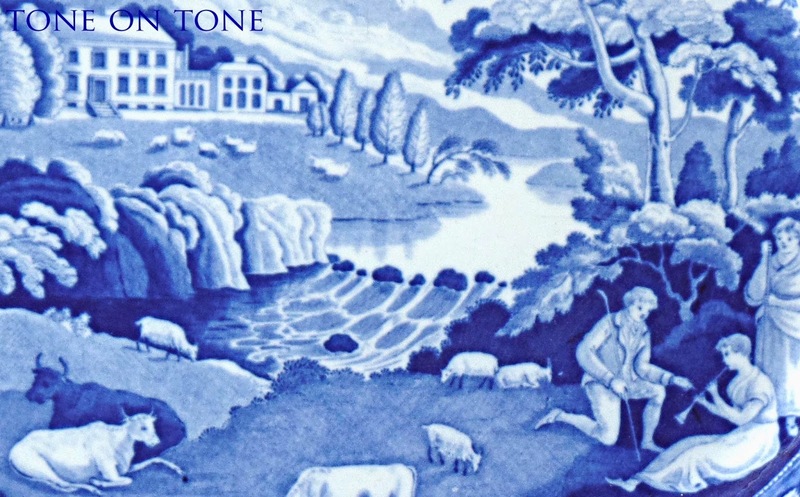 Staffordshire, England produced some of the best known blue-and-white transferware in the world. 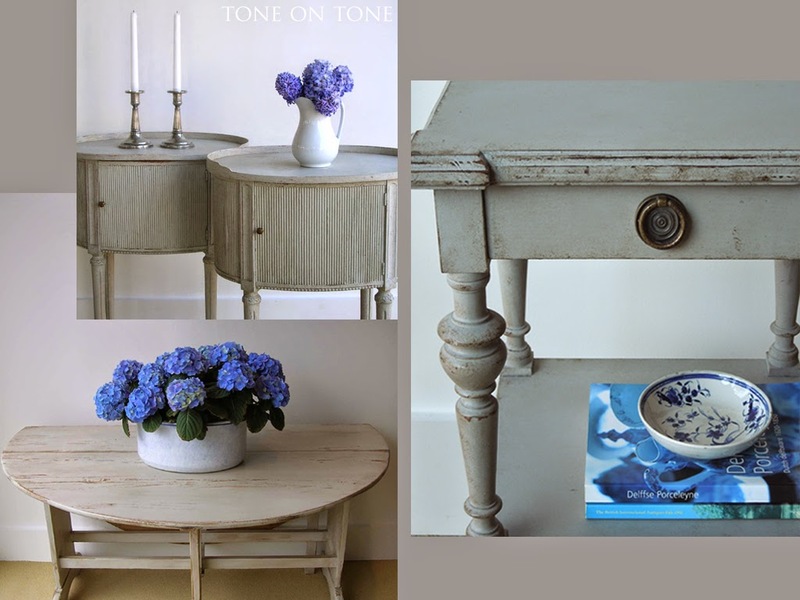 I collect and sell both the pale blue Romantic (above) and dark blue Historical pieces (below). One pattern I cannot resist is "Girl Musician" produced by John and Richard Riley (1796-1828) in Burslem, England. I adore the bucolic scenery complete with country house, meandering river, grazing animals, kneeling shepherd, girl playing the flute, and a border of wild roses - pure bliss! Resting on this French Louis XVI (Ca. 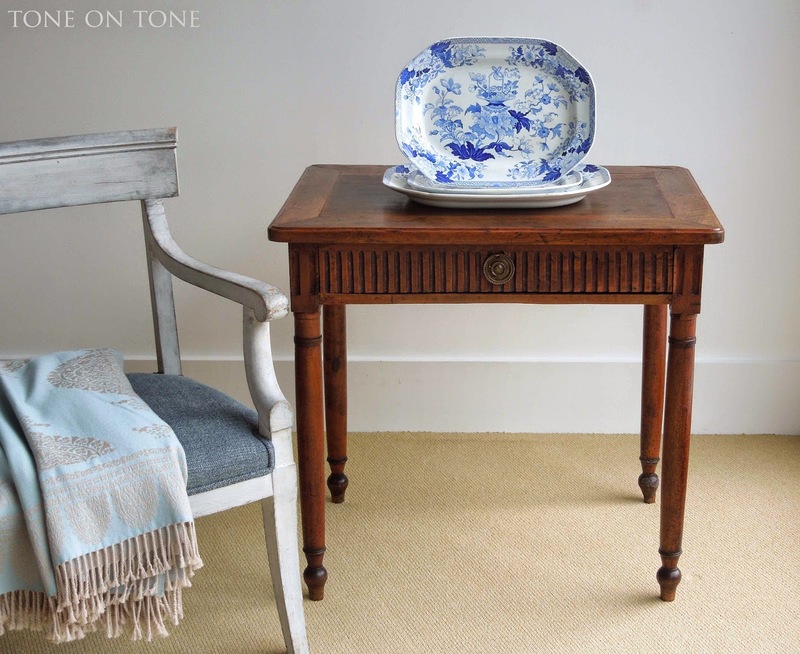 1790s) walnut side table is a graduated set of 3 platters from Wedgwood. 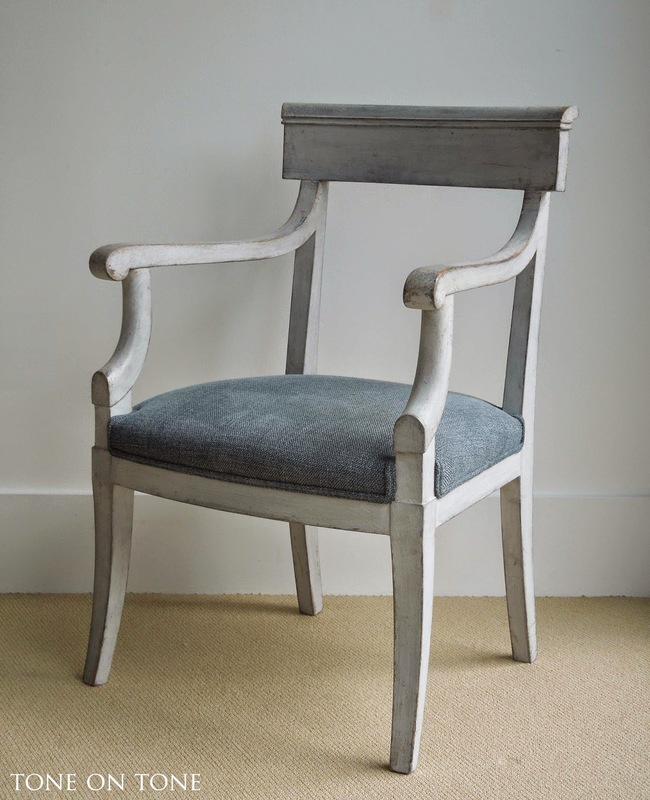 The French classical style armchair is upholstered in a velvety blue cotton. 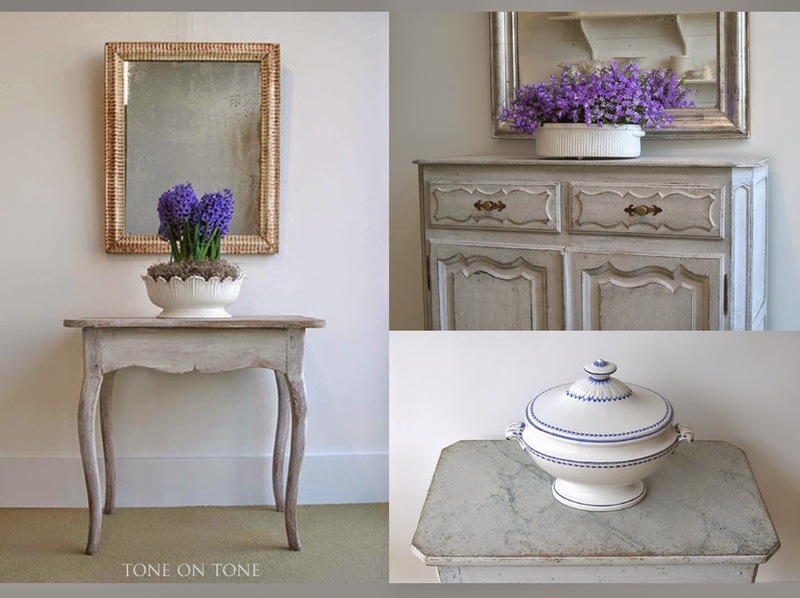 BELOW: These items have all sold, but I am sharing this photo to show how a dash of blue and white can liven up a dark wood surface. 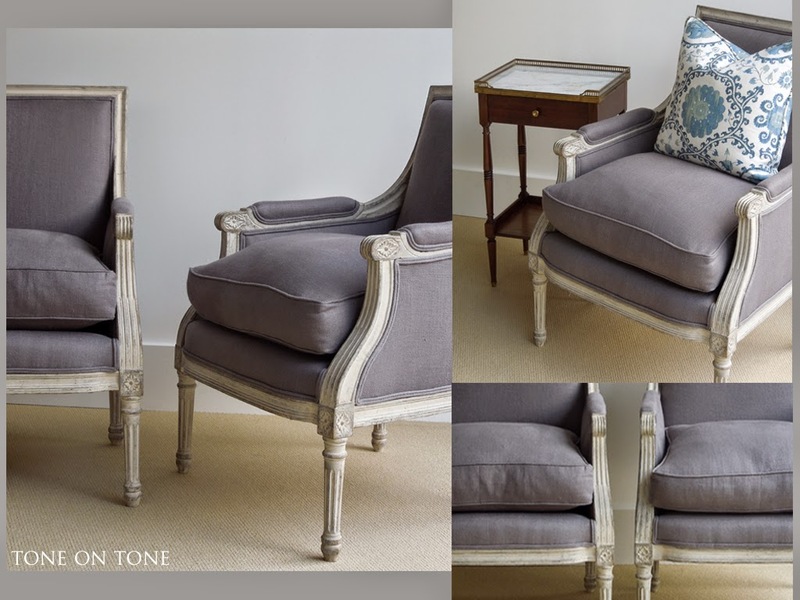 A pair of French bergeres (Ca. 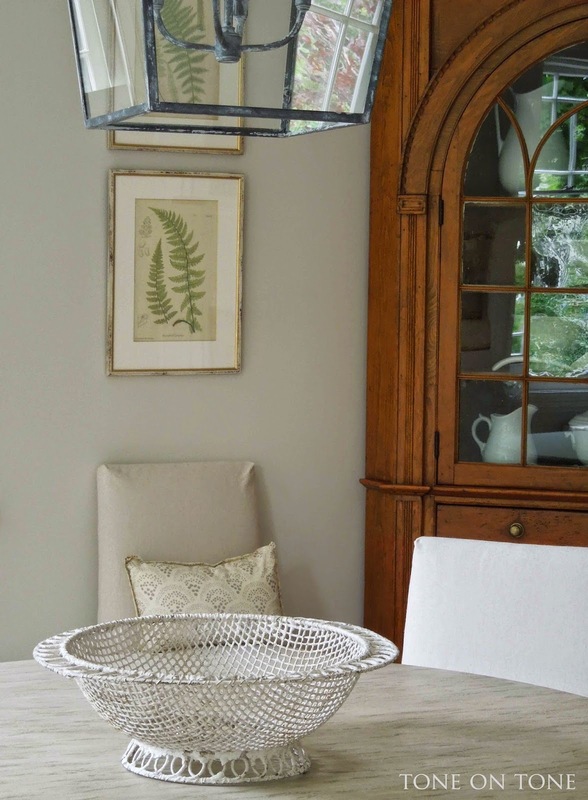 1890-1900s) in a greige paint with all new blue-gray Belgian linen upholstery. This Louis XVI model with the rectangular backrest happens to be my favorite type of bergeres. When I come across these, I will splurge on the down-filled seat cushions. 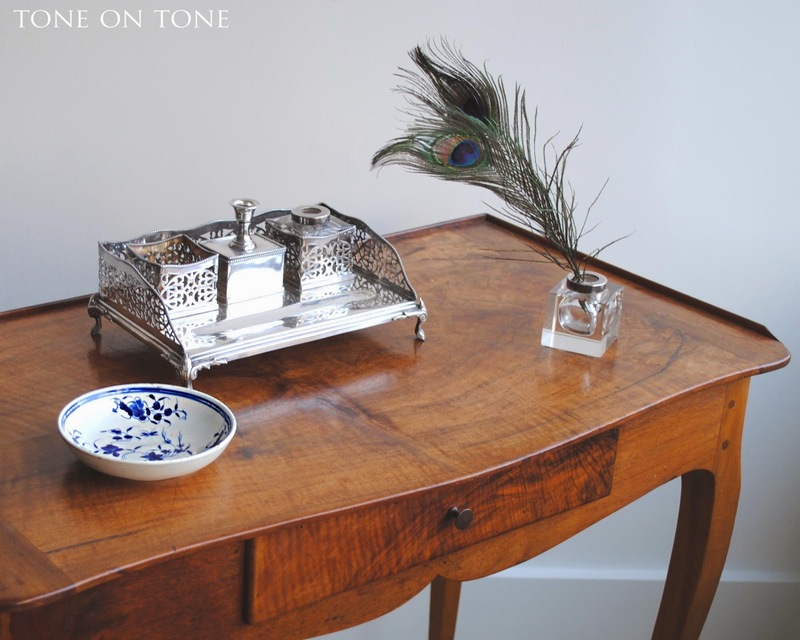 I love how they "pop" next to French occasional table's mahogany surface - that's the beauty of mixing finishes! 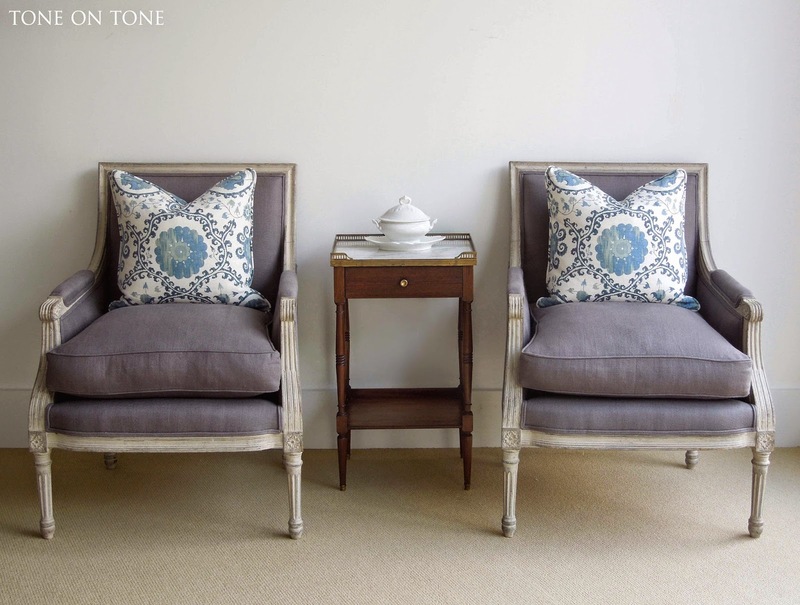 Pillow fabric is from Carlton V.
ABOVE: A blue painted Swedish desk against Gustavian oak doors at a friend's manor home in Sweden. 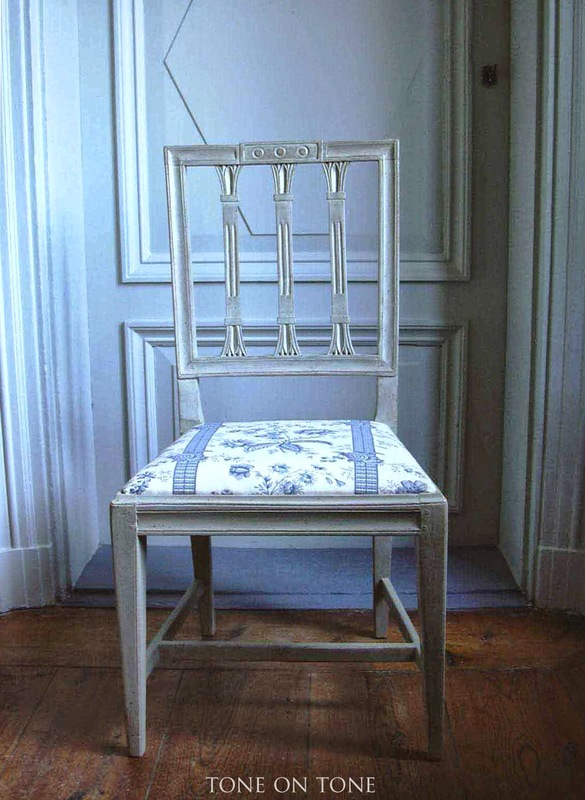 BELOW: The same manor house with a Gustavian chair in a printed linen. Both the desk and chair I purchased and sold a while ago. Playing it cool! 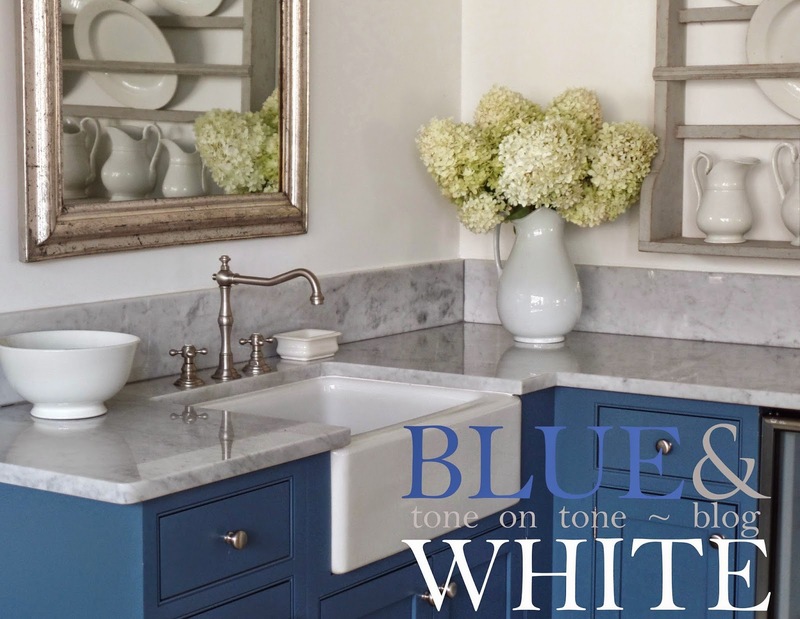 Two collages showing accents of blue and white on gray surfaces. These pieces have all sold - apologies! 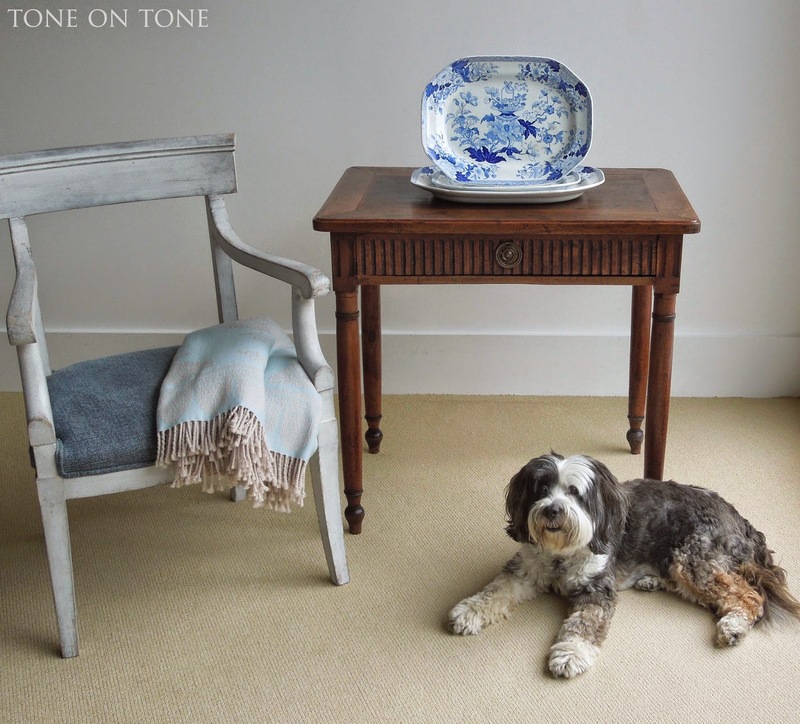 Last but not least, blue and white looks dazzling with Mocha, our sassy 14-year old Tibetan Terrier in need of a good brushing! Well, hello! It's been a while. How did we get to mid August so quickly? 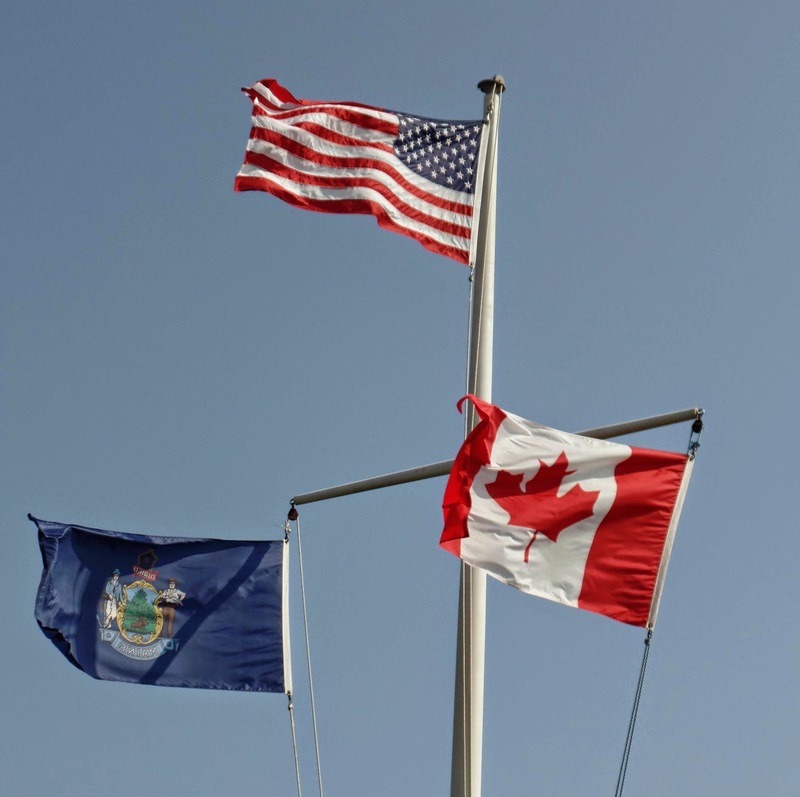 Tom and I have been dividing our summer between DC and Castine, Maine. If you spot a silver mini-van with DC tags crammed with dogs, furniture and stuff puttering along I-95, that would be us! Wave hi, okay? There's much to catchup on, so let's start with our garden in DC. This August has been cooler than normal, and it feels marvelous. The plants love it, too. 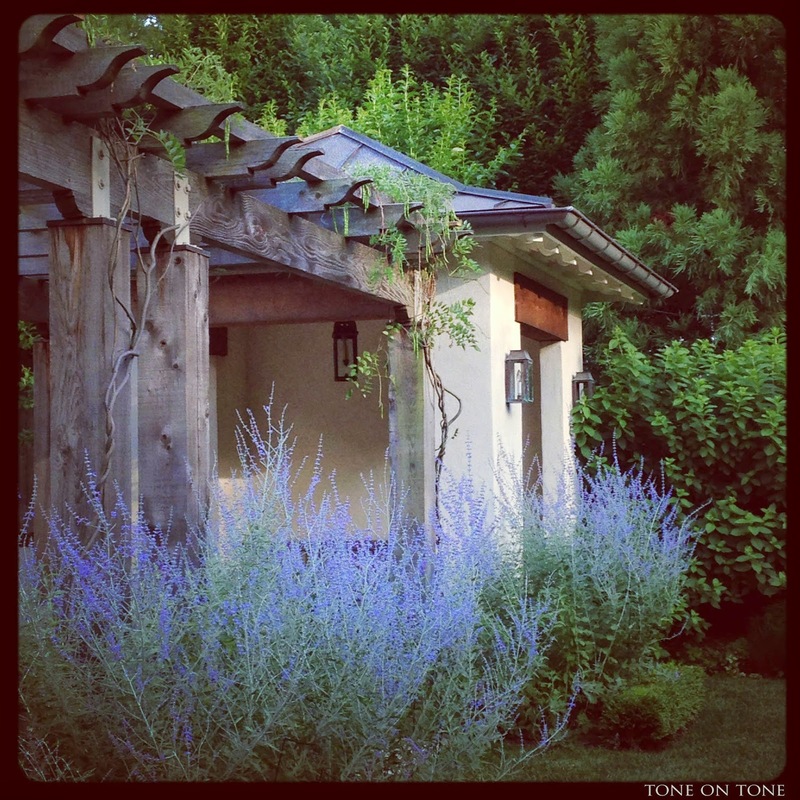 The first photo from a few weeks ago shows the row of Russian sage along the pergola. I shared it on INSTAGRAM and many of you "liked" it - thank you!! A couple weeks later, the Limelight hydrangeas to the right of the garden pavilion burst into bloom. Next to the hydrangeas is Blue Fortune agastache with its lavender-blue flowers. Both long bloomers are showstoppers of the August garden. The white border really shined this season. 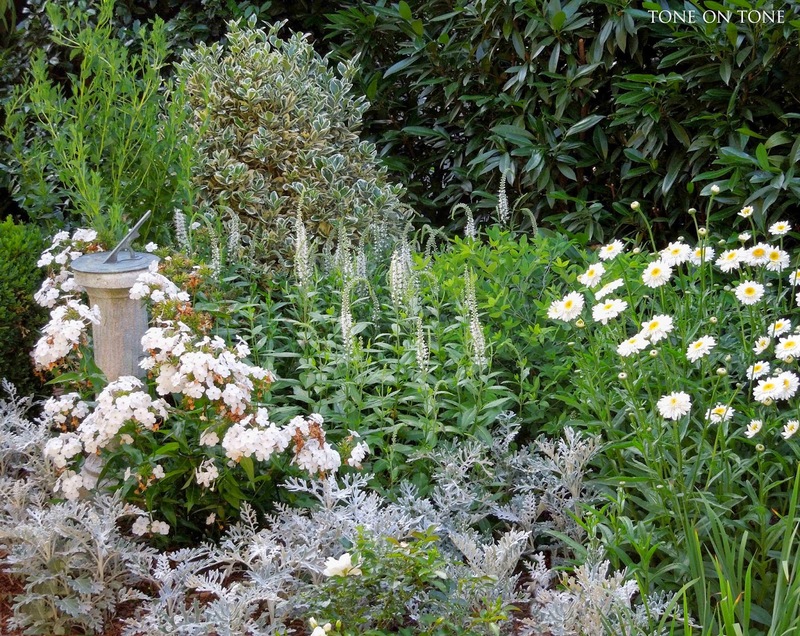 With more of a cottage garden spirit, the planting here is less formal. There is still structure, such as the evergreen shrubs to anchor the perennials, but the overall appearance is a bit softer. Surrounding the granite sundial are Minnie Pearl phloxes - this is their second flush of flowers. 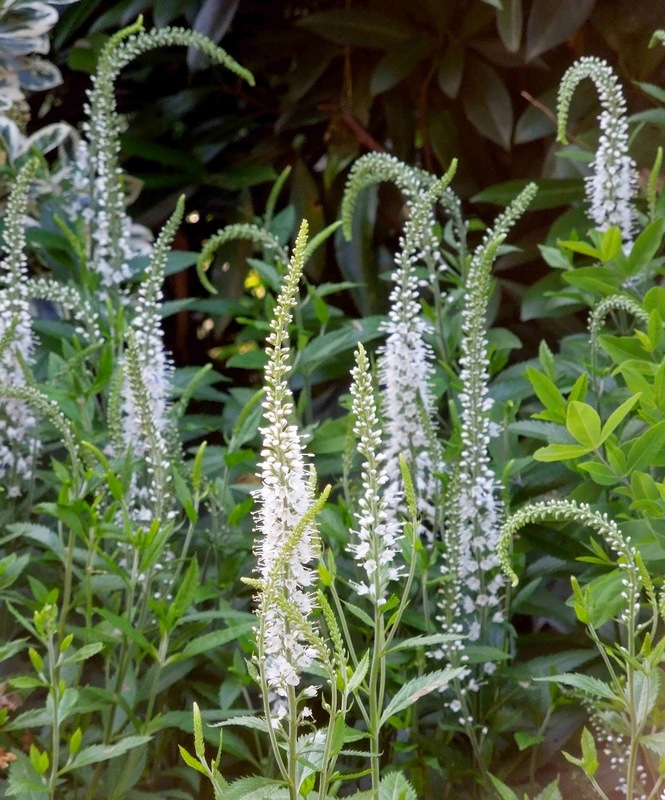 Also in bloom are veronicas (below) and daisies. Not much new inside except for a few tweaks and additions of books and creamware. 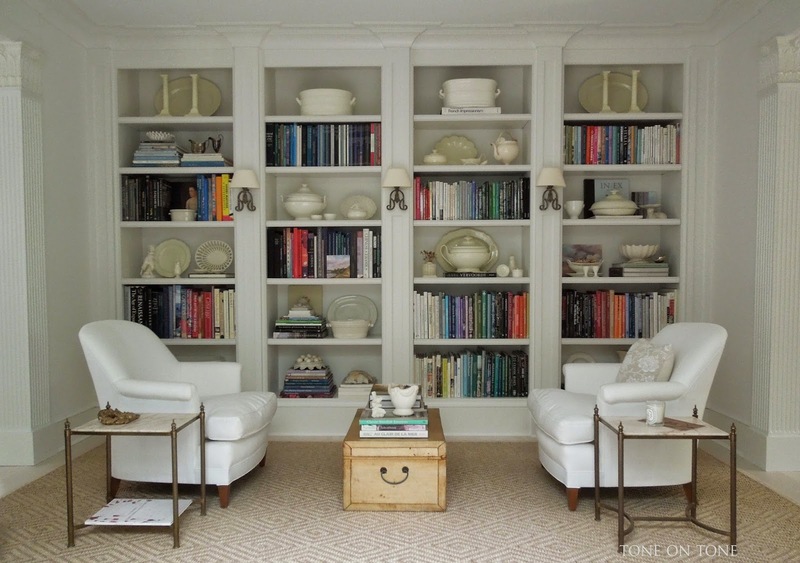 I was invited by Kim at Savvy Southern Style to chat about my favorite room - did you see my guest post on our library? Thanks so much, Kim! 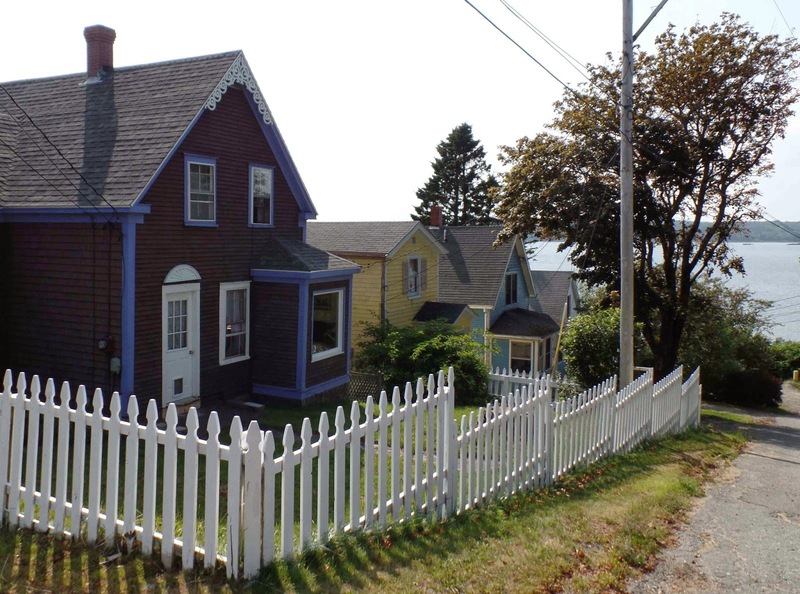 In Castine, the exterior of our grey house has yet to be painted as the short summer is, as you can imagine, the busiest season for local painters. 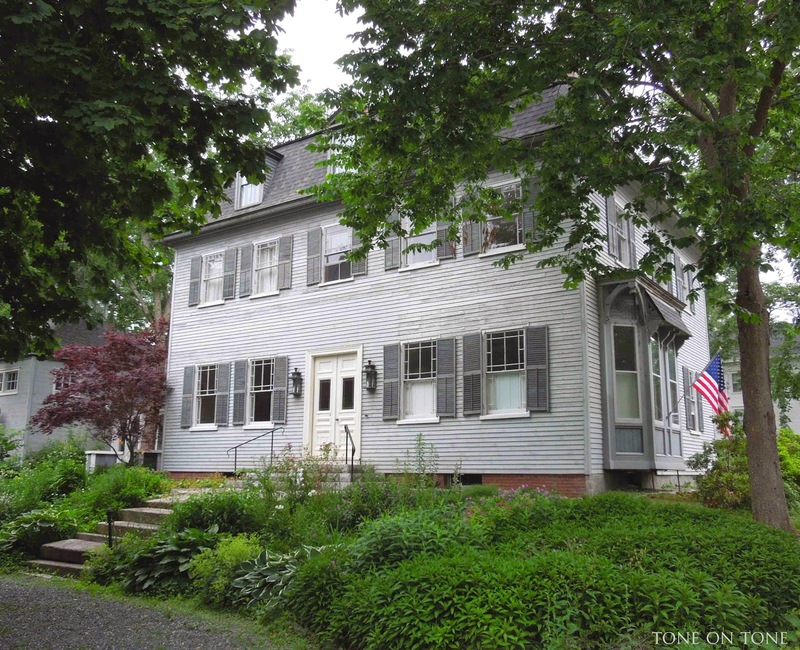 While I love grey, I plan to perk up our historic home with crisp white paint, graphic black shutters and sunny yellow doors. So that's the exterior color scheme! 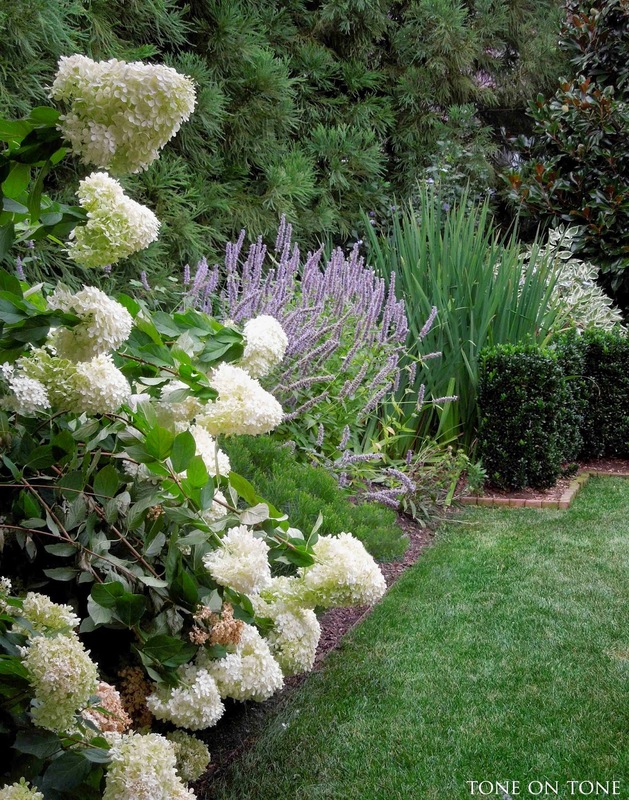 As for the gardens, we've planted 18 Limelight hydrangeas, five white spruces and many native cinnamon ferns. The front perennial beds need simplifying and weeding. I'm thinking of a white, pale-yellow and green garden - simple, cheerful, summery! Here is a sneak peek of the dining room with botanical prints of ferns inspired by the local flora. 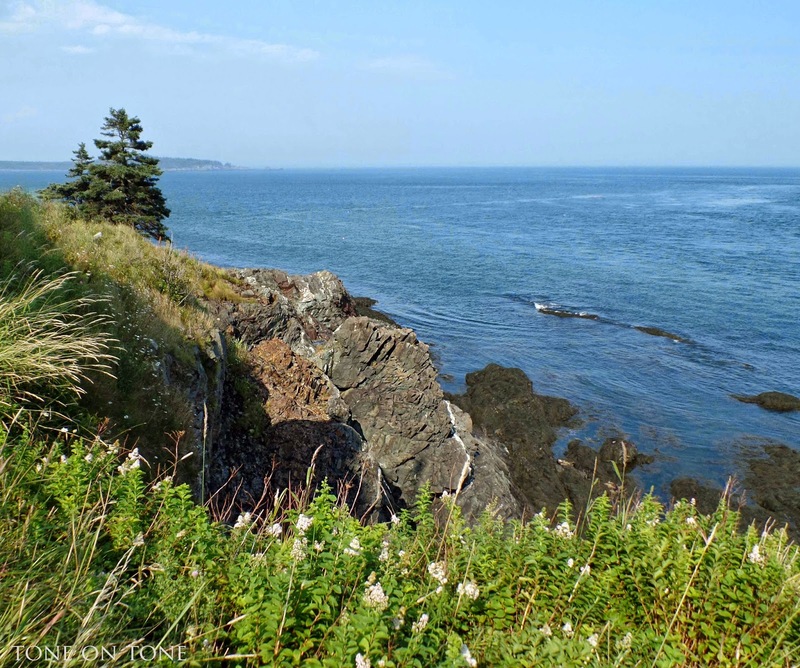 We continue to explore beautiful Maine, and took a "daycation" up to Lubec and Eastport. 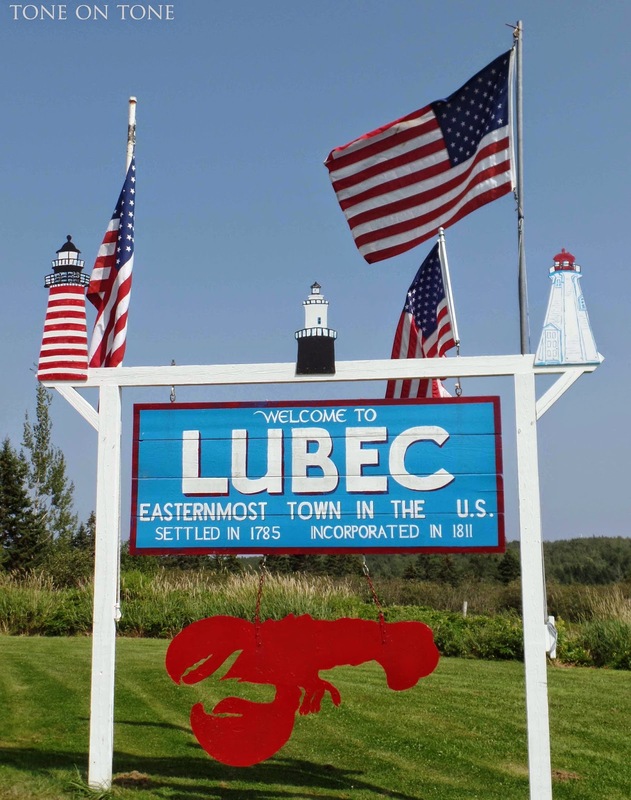 Lubec was just delightful - an unspoiled Downeast coastal gem. Being the easternmost town in the U.S., you can enjoy the sunrise before the rest of the country. Also the fresh, salty air! 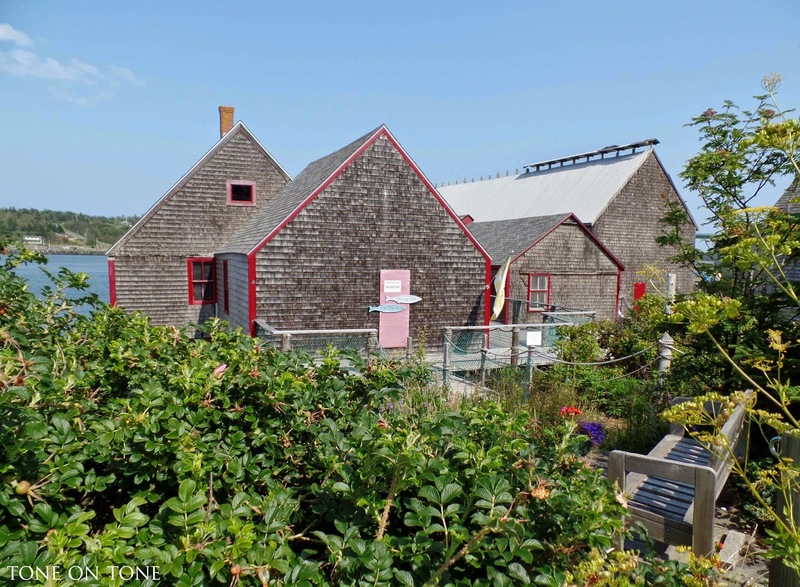 Don't miss The McCurdy Smokehouse Museum, the last traditional smoked-herring facility that closed in 1991. Next door, there is a charming gallery featuring the works of local artists. 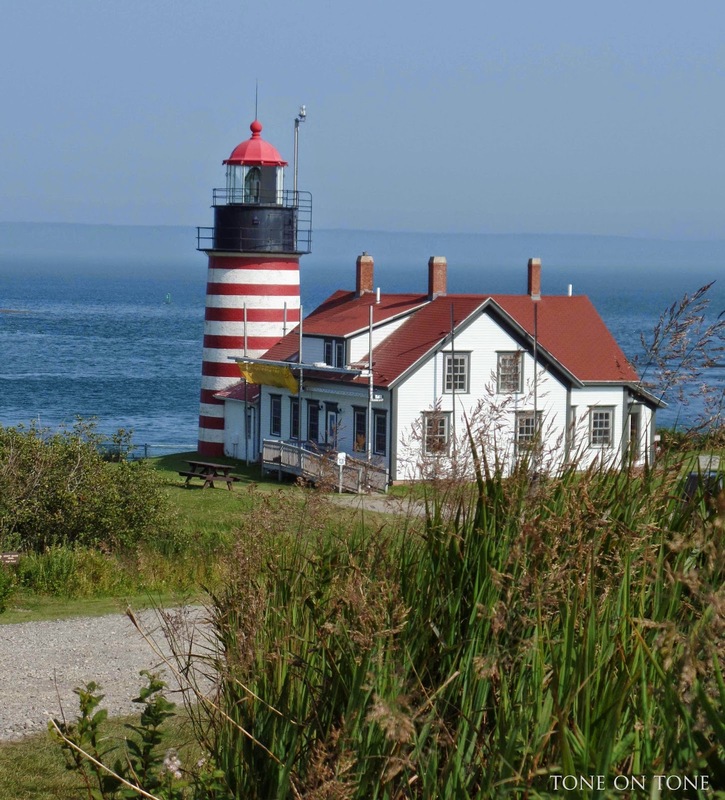 Across the Lubec Narrows, enjoy views of the Mulholland Point Lighthouse on Campobello Island, Canada. 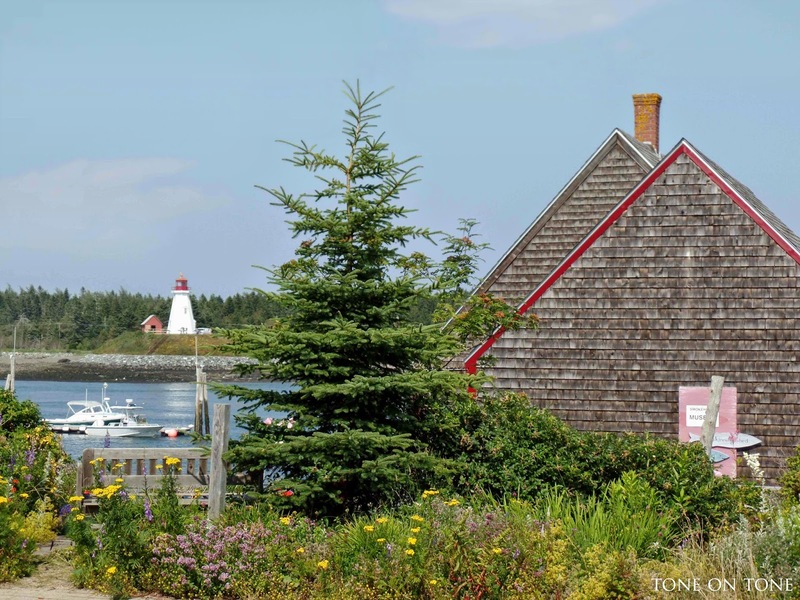 If you are a lighthouse enthusiast, this is the region for you. 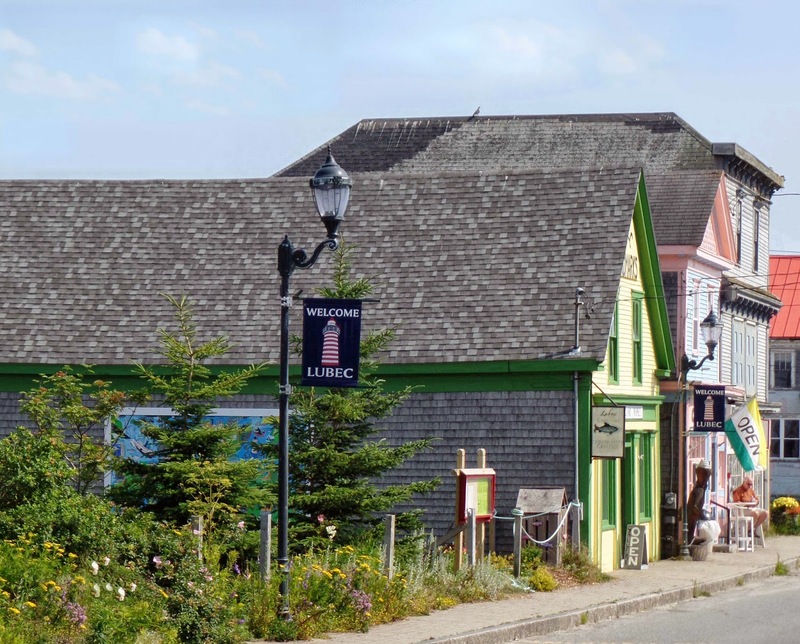 There are five around Lubec and another one in Calais. 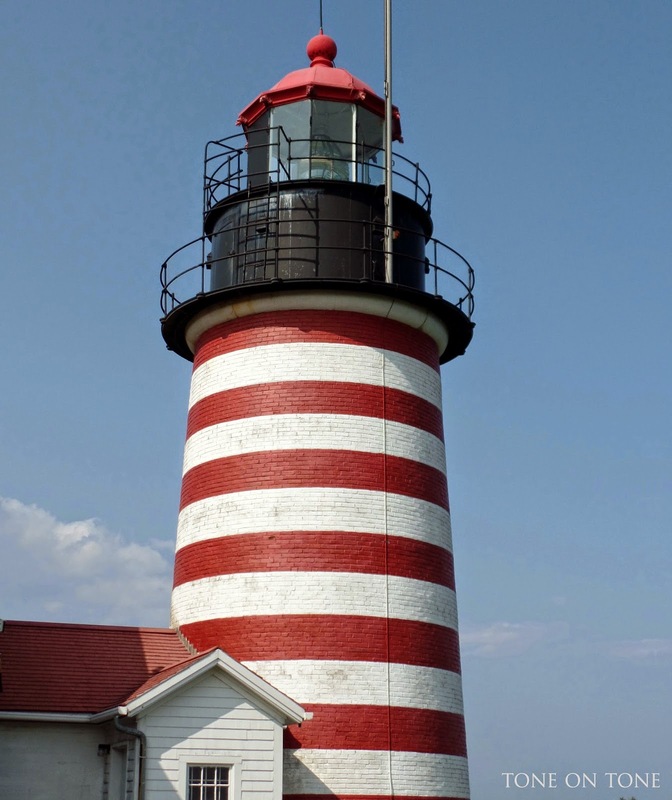 Speaking of lighthouses, the boldly striped red-and-white West Quoddy Head Light is stunning against the blue sea. 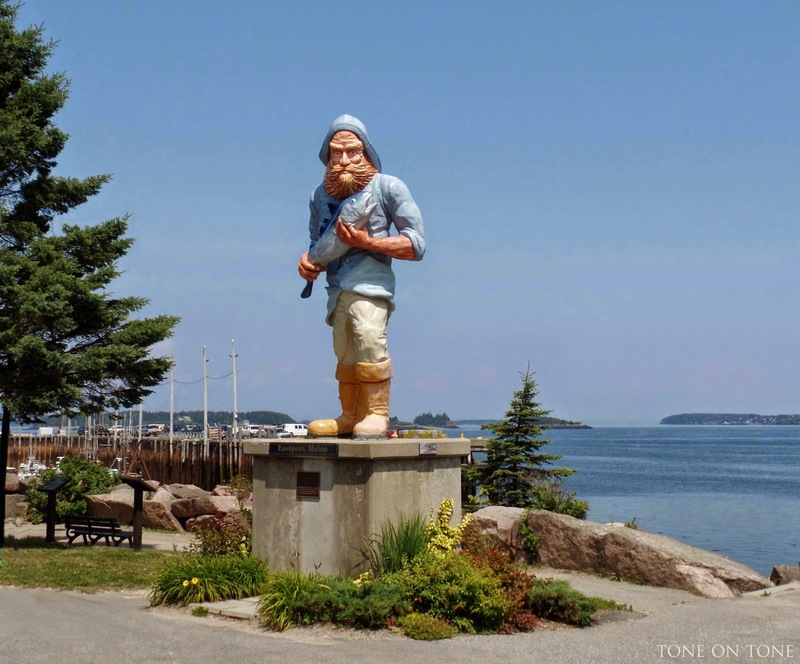 I hear it is quite the Maine experience on a misty, foggy day with the sound of the foghorn. 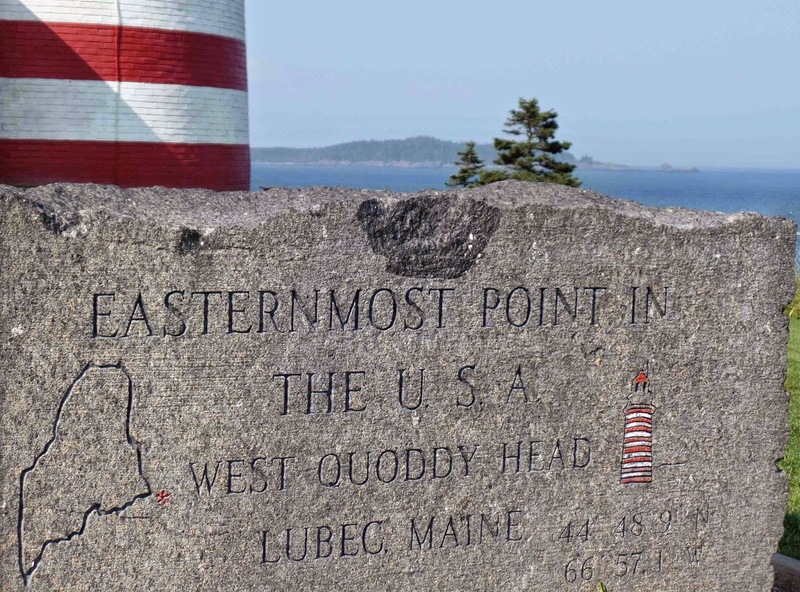 The most eastern point in the U.S. - quite the setting with the rocky cliffs, big tides and gusty winds! 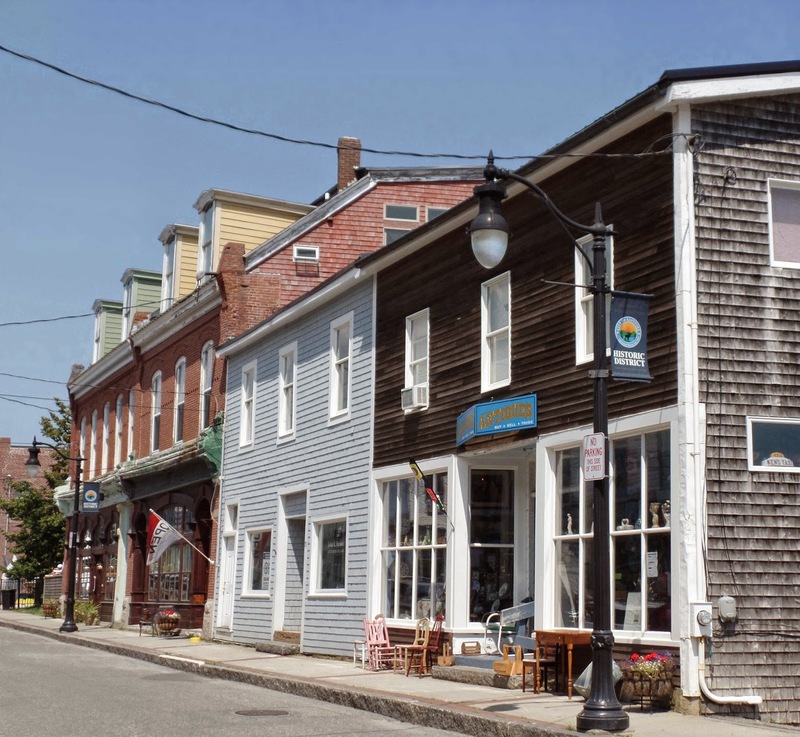 After Lubec, we made our way to Eastport, a small city with lots of galleries, cafes and antique shops. We had a wonderful time chatting with the very friendly locals. 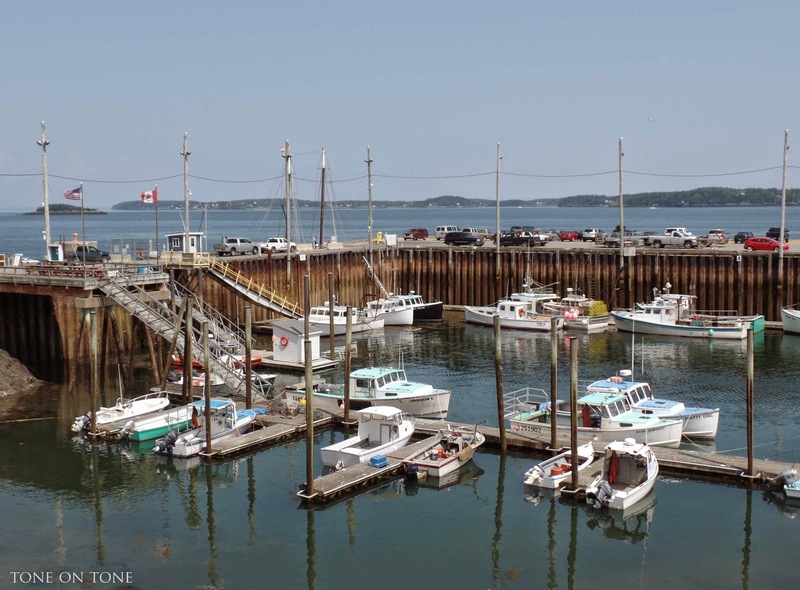 BTW, the Port of Eastport is the deepest natural seaport in the continental U.S. 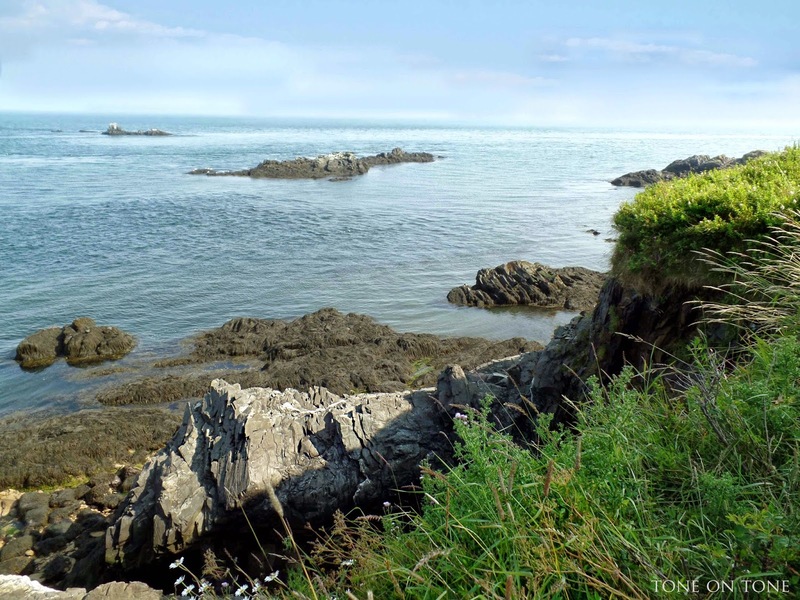 It was low tide when we visited. 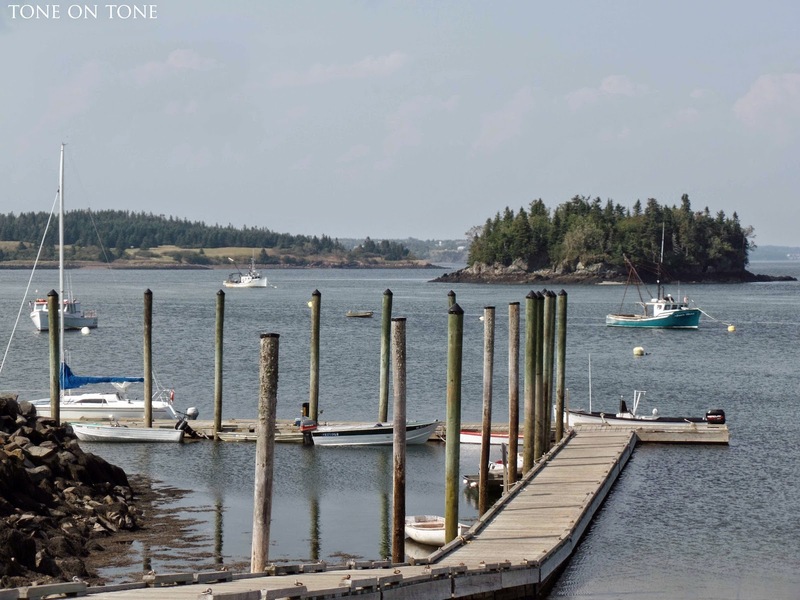 Hope you've enjoyed seeing more of Maine!